Brad Pitt and Angelina Jolie have designed the first men’s item for the Protector Collection, the line of limited edition fine jewels and silver objects created in collaboration with famed London luxury goods firm Asprey to benefit charity. 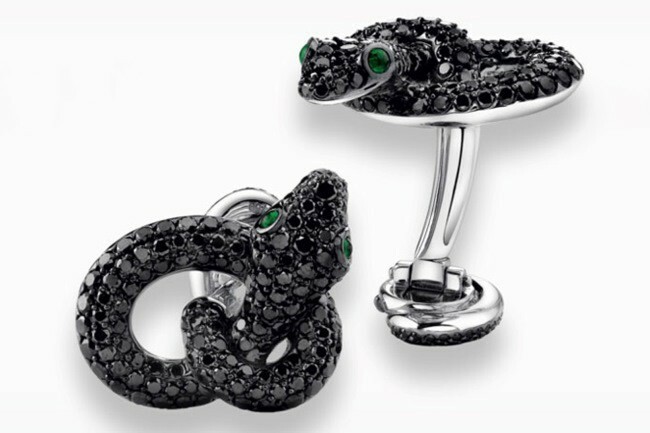 The Protector black diamond cufflinks in 18k white gold with black diamonds and emeralds, for about $11,000, feature the collection’s signature serpent emblem. The design is based on Jolie’s reflection on the serpent as an iconic guardian and cultural symbol of family protection, inspired by a ring she was given while pregnant with the couple’s first child Shiloh in 2006. Each piece in Protector Collection is a limited edition, handcrafted at Asprey’s London flagship store in New Bond Street. Asprey, founded in 1781, holds a Royal Warrant from the Prince of Wales, one of several granted to the firm by the British Royal Family over the years. The black diamond serpent cufflinks match rings, earrings and a pendant in the women’s collection. All proceeds from the Protector Collection pieces are being donated to the Education Partnership For Children of Conflict (EPCC). 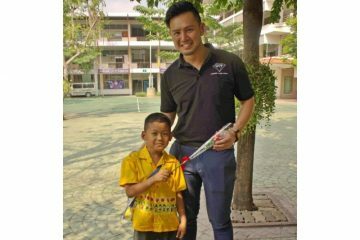 Co-founded by Jolie, the organization raises awareness and funds to educate child victims of war, conflict and natural disasters.